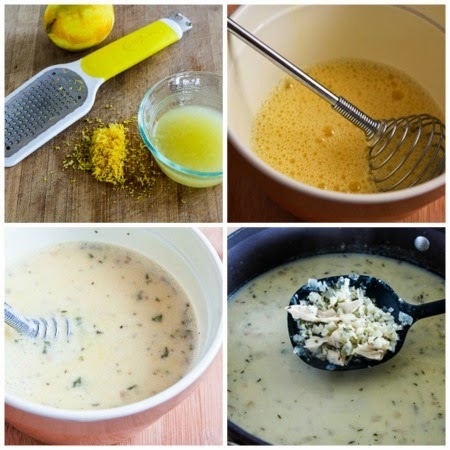 Greek Egg-Lemon Soup is traditionally made with low-glycemic Uncle Ben’s rice, but it was also delicious with cauliflower rice for a low-carb version! Use the Recipes-by-Diet-Type Index to find more recipes like this one. 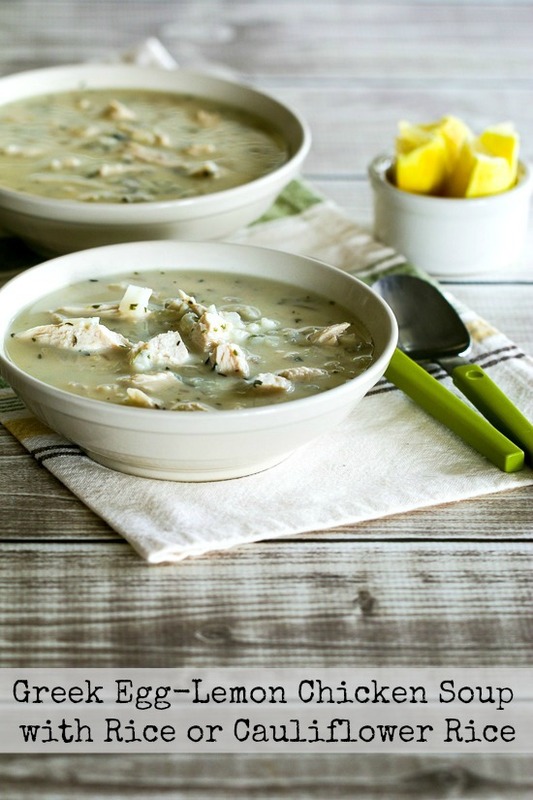 Click here to pin Greek Egg-Lemon Chicken Soup with Rice or Cauliflower Rice! Greek Avgolemono Soup or Egg-Lemon Chicken Soup is one of those dishes I’ve been passionately in love with ever since the first time I tried it, probably back in college, so that’s a long time I’ve been loving this chicken and rice soup that’s thickened with eggs and lemon. I’m guessing I first tasted Avgolemono Soup at The Other Place, a Greek-American restaurant in Salt Lake City, and I still like their version of this classic Greek soup. I first made this soup for the blog in 2006, and my version has dried parsley and dried thyme added to the stock, plus a little lemon zest, an idea that came from The Frugal Gourmet Cooks Three Ancient Cuisines, a very old cookbook with lots of good ideas. What makes this soup special is the Avgolemono sauce that you mix into the soup to thicken it, a mixture of beaten eggs, and fresh lemon juice and zest that’s mixed with some of the hot soup and then gently stirred back into the rest of the soup. The egg-lemon sauce that thickens the soup isn’t really that difficult to make, but you must be careful not to let the soup boil after it’s been added or it will curdle. In the original recipe I started with chicken thighs and cooked them to make broth, but now I usually make the soup with leftover rotisserie chicken and chicken stock from the freezer. 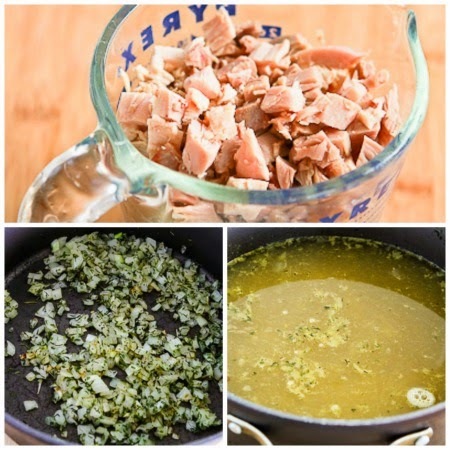 Recently I had both those things on hand when the idea struck me to try making a low-carb version of this favorite soup by replacing the rice with cauliflower rice.It was definitely a success with the cauliflower rice, although I have to be honest and say that I like the soup a best with the Low-Glycemic Uncle Ben’s Converted Rice I normally use. If you don’t have leftover cooked chicken you’ll need to cook 3-4 chicken thighs (or 2 chicken breasts) in some chicken stock, but I had rotisserie chicken that I just cut up to make 2 cups diced chicken. Saute the onion the onion, dried parsley, and dried thyme and then simmer with homemade chicken stock for 10-15 minutes. If you’re going to use cauliflower rice, buzz chopped cauliflower in the food processor until you have about 1 1/2 cups chopped cauliflower. For rice, measure 1/2 cup rice, preferably Uncle Ben’s Converted Rice. Add the raw cauliflower (or rice) to the stock mixture and simmer until until it’s done, about 20-25 minutes for rice or cauliflower. Add the diced chicken to the soup and simmer over very low heat for 5 minutes. Greek Egg-Lemon Soup is traditionally made with low-glycemic Uncle Ben’s rice, but it was also delicious with cauliflower rice. Heat the olive oil in a large heavy soup pot, add the onion and cook over medium-high heat until the onion is softened and starting to brown. Add the dried parsley and dried thyme and cook a minute or two more. Add the 6 cups chicken stock to the soup pot and simmer 10-15 minutes. Add the rice or raw cauliflower rice and simmer over medium-low heat until rice is tender or cauliflower is fully cooked, about 20-25 minutes. Then stir in the diced leftover chicken (or turkey). Turn heat to lowest possible setting, and cook about 5 minutes more. Zest a lemon and then squeeze additional lemons to get 1/4 cup fresh lemon juice. Beat eggs with whisk until they are starting to get frothy; then whisk in lemon juice and lemon zest. Remove one cup of hot broth from the soup, let the broth cool slightly. Then whisk 1/2 cup and then another 1/2 cup into the egg mixture, beating well between each addition. Whisk this mixture into the big pot of soup (be sure the temperature is very low) and let the soup heat gently. DO NOT BOIL after the egg-lemon mixture has been added. This soup cannot be frozen and must be reheated carefully or the eggs will curdle the broth. It will keep in the fridge for a few days, but it’s best freshly made. Uncle Ben’s Converted Rice is the lowest-glycemic type of white rice, and if you use that this Greek Egg-Lemon Soup it would be good for phase 2 or 3 of the South Beach Diet. Using cauliflower rice would make this a very low-carb soup, suitable for any phase of the South Beach Diet or any other type of low-carb eating plan. Could you use frozen cauliflower rice in this recipe? If yes, would you add it frozen? Heat it up halfway/all the way before adding it to the soup? I have a lot of the frozen cauliflower on hand so whenever I can I prefer to use it vs. buying more and making it from scratch. I haven’t made it with frozen cauliflower rice, but I think it will work. I would probably let the rice thaw on the counter top while you cook the soup to the point of adding the rice. Then add the semi-frozen cauliflower rice and simmer as in the recipe. I’d start to check for doneness of the cauliflower rice after about 15 minutes, although I’m not completely sure how long it will take. And this is just my best guess about how it would work! I’d love to hear back if you try it! I’ve had this in Greece and in many Greek restaurants and never seen it made with orzo. But i’m guessing it’s one of those classic dishes that has many variations. I thought this wonderful soup was made with orzo usually; but rice seems good too; and glad to know that converted rice is low-glycemic–did not know that. You're the second person who has mentioned orzo, but I've never had it that way. Yes, I was so excited when I discovered that the converting process for rice makes it much lower on the glycemic index! Hope you enjoy the soup. Kalyn, you are right on time; must have read my mind. I was looking for an Avgolemono Soup recipe. Thanks. I will make cauliflower rice for myself and orzo for my husband (he tolerates starch better than me). Thanks again, I will try this. I made your Chicken Paprikash over the weekend. Very yummy. Thank you for all your work. It is appreciated. Thanks Mary; so glad you are enjoying the recipes. I'm definitely going to try this cauliflower rice version!! p.s. In your instructions before the actual recipe, you say to zest a lemon and measure out 1 tsp of lemon juice instead of 1 tsp of lemon zest!! Hope you enjoy Clare. Thanks for catching that, will fix it right now! Debra thanks! So glad you liked it. Oh my, this is a one for me. Love it. I'm sorry that your internet speed is making it frustrating to see the recipe; unfortunately there are over 2,200 recipes on the site so there's no way I have time to add something like that for that many recipes. For those with a slower connection that wish the recipe came up before the process photos, would it be possible to add an internal link that jumps directly to the recipe without changing the format? Hi Kalyn – Quick question. 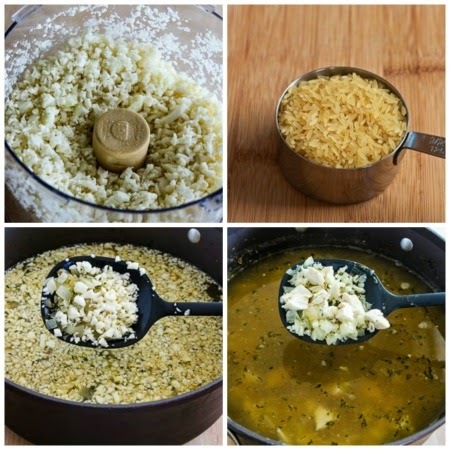 Does the cauliflower rice need to be cooked per the recipe before being added to the soup, or do you just add the processed raw cauliflower directly into the soup? Thanks for the clarification. PS. My husband and I have been using your blog as part of our 2014 New Years resolution and it's still going strong into 2015. Thank you! Hi Pam, glad to hear the recipes are helpful for you. We added the cauliflower raw and just cooked it in the soup until it was tender. I will edit the post to clarify. Anne hope you enjoy! I love seeing the improvement from the old photos. Adding to my collection of cauliflower-rice-friendly recipes! Love those flavors. Also ADORE the 9 year old photo. Here's to evolution! Your “White on Rice” photography inspiration is showing, Kalyn, lovely photo showing off your soup! And you are awfully brave to show off the old photos. I just delete them! PS Believe it or not, this is a soup I’ve never tried. Adding it to the list! Thanks so much Alanna. I still have my days where I think the photos look awful, but sometimes I am pleased with them. You MUST try this soup right away. Seriously, it is so amazing. Erin, so glad you like it! This soup is lovely – thank you for sharing! This will definitely be added to our soup list for the winter! It looks delicious and easy to make. Thank you for sharing! Greek cuisine is wonderful, but… only with Greek ingredients! Hey Kalyn, your Avgolemono Soup is a Recipe Guessing Game on Knapkins. Think your friends can win? Mmmm… love the look of this. On one of the LighterLife diet plans – Can't wait to eat proper food again. This sea bass recipe looks great too. Best soup I have tasted in ages, and now on the favourites list. This is such an original way to use leftover chicken or turkey. The brightness of the lemon in Avgolemono is always tempting. Anna, good to know that we're both making it the same! I love this as well; one of my favorites for years! i just love this soup. it's one of my all time favourites because the lemon just lifts the flavour incridibly. a great one in winter to remember that fresh zing of summer. your recipe is very similar to my own, so good to know i'm doing it right! Good to know about the rice. Thanks Kalyn. Suzanne, I do sympathize, but I don't think that's a change I'd want to make; it would completely change the format of my blog posts and I have over 900 recipes and want to keep the format consistent. I will think about it though and see if I can come up with any ideas to help. Jeanette, that method of beating the egg whites separately may be more traditional, I'm not sure. But this method still produces a delicious creamy soup. I've had it without any added herbs or lemon zest in restaurants, and it's delicious that way as well. I've been sitting on a friend's recipe for Avgolemono the last few weeks. Made the stock/chicken and ended up freezing it and haven't gotten around to actually making the soup. Her version (from a Greek cookbook) is slightly different. The eggs whites are beaten separately until stiff, then the yolks are added back. She did mention too that it is a little tricky when adding the eggs into the broth. Interesting that converted rice is used, and I like the addition of thyme and lemon zest for extra zip. Love your recipes! Would it be possible for you to post the recipe at the top of your posts, before all of the method information with photos that take awhile to download on a slow connection? Lydia, now I must go check out your version! Zesty, "converted" rice has been parboiled so some of the starch is removed, which is what makes it better for South Beach. It was supposedly the only type of rice Julia Child would use! I think regular rice will work, but the converted rice stays firm in soup a little better. (And all my Greek friends tell me that converted rice is what they use.) I'd substitute Basmati if you have that, but regular long grain rice would be okay too. I am a Greek food novice, but this looks fantastic. What is converted rice, exactly? Can I substitute regular rice? Avgolemono is one of my favorite soups, and I'm intrigued because this version is so different from mine. Must give it a try. Thanks for the recipe – this tastes just like a Greek restaurant I used to love in Chicago! I think the soup was a bit too hot when I added the milk because I can see tiny pieces of what might be scrambled bits of egg, but it still tastes bright and soothing and yummy!